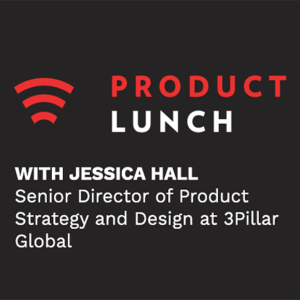 Jessica Hall, 3Pillar’s Senior Director of Product Strategy & Design, recently presented a Product Lunch webinar in conjunction with Product Collective. Her webinar, titled “Out Innovating the Competition,” focuses on how to stay ahead of the competition when managing products, while still effectively planning product strategy and charting out a product roadmap. Jessica explains how 3Pillar’s Product Mindset – the three core tenets of which are Build for Outcomes, Minimize Time to Value, and Excel at Change – allows product teams to remain focused on the end customers’ needs when building a product. She shares how she uses the Kano Model to react to competition when building and following a product roadmap, and how to remain focused as a team on creating what’s right for the customers. Watch Jessica’s entire webinar by clicking here. Product Lunch is a monthly webinar produced by Product Collective, a community dedicated to helping product people around the world connect, collaborate, and inspire each other. The community was founded in 2014 intent on redefining and shaping the future of product management. In addition to Product Lunch, Product Collective hosts Industry: The Product Conference, an annual conference for product people, and produces Product Brief, a weekly newsletter.